It is provided outside the building under a covered place (varandah or poarch). 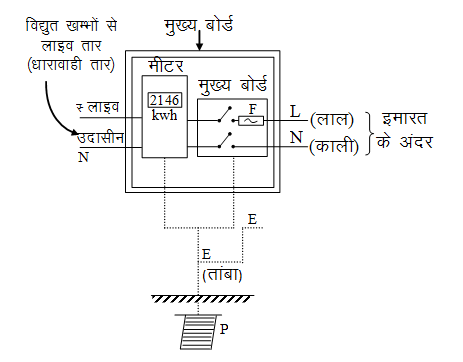 It contains the meter (energy–meter) and the main switch. From the street electric pole a thick rubber insulated cord reaches the main board. It contains two thick copper or aluminium wires, one covered with red and the other covered with black (or brown) plastic covering. They from the live line wire (L) and neutral line wire (N) respectively. Live line has a potential of 220V whereas the neutral wire has zero potential (with respect to the earth). They enter the main board and are connected to the meter. Wiring ahead is provided by the house owner himself. These wires are also red and black plastic covered. From the meter the wires enter the main switch. In the main switch, a fuse F is provided in the live wire. A third wire is a thick bare wire of copper, called earth wire E. It is connected to an earth connection which consists of a thick copper plate P buried deep inside the moist earth.